We have a special guest and topic for Wiki Wednesday this week. Companies are engaging wikis to create customer communities and managing customer relationships, usually to capture customer ideas for new products and services or to provide support for existing ones. Creating customer facing wikis can be challenging and easily results in failure or only marginal success. Reviewing several cases of customer facing wikis, the presentation draws conclusions about success and failure factors in the implementation of customer facing wikis. Christian Wagner is Professor of Information Systems at City University's Information Systems Department. He received his Ph.D. in Business Administration from the University of British Columbia in 1989. Thereafter he spent seven years as a faculty member at the University of Southern California, before joining City University in January 1996. Wagner specializes in the development and study of decision support systems, creativity support, and knowledge management with wikis and weblogs. The event is a brown bag lunch at Socialtext in Palo Alto. Sign up on the wiki, Facebook or Upcoming.org. Wiki Wednesday in Palo Alto is postponed until July 11th because of Independence Day. We'll host a talk by social media researcher Eszter Hargittai. London is certainly not celebrating our independence. On the 4th, they will be discussing the rise of BTiddlyWiki with Jeremy Ruston, but in a lightening talk format other speakers include self-organizer David Terrar, Lars Plougmann, Alan Wood, Andy Roberts, Scott Gavin and Ben Gardner. Thanks to BearingPoint for hosting. Wikipedia, a wiki-based encyclopedia, has become one of the most successful experiments in collaborative knowledge building on the Internet. As Wikipedia continues to grow, the potential for conflict and the need for consensus building and coordination increase as well. This talk examines the growth of such non-direct work and describes the development of tools to characterize and identify conflict and coordination costs in Wikipedia. The results may inform the design of new collaborative knowledge systems. All day before we are having a Wikithon. Unlike last month, most of our developers will be remotely participating so you can easily too. This has turned into our version of 20% time, a day a month where people can work on their own projects. Even non-developers are engaging in creating or participating in wiki communities. Socialtext is hosting a Wiki Hackathon that is open to the public tomorrow. If you want to hack wiki, any wiki, and maybe with our developers, the thing starts at 5pm PST both in Palo Alto and IRC channel #socialtext on irc.freenode.net. Chris Allen will also be giving an update on SynchroEdit. Come on by Wiki Wednesday this week for a conversation about Socialtext 2.0 design and SocialPoint with Kirsten Jones and whole team. The discussion will be both technical, and not, and pizza. Tonight at Wiki Wednesday: Bernard Peuto and Paul McJones of the Software Collection Committee will give a brief presentation on the SCC and solicit input from the wiki community on how wikis can be used to support this work and the overall mission of the Computer History Museum. Sign up here and see you at Socialtext. UPDATE: Veni. Vidi. Wiki. The published story, and commentary by Ryan Singel, The Wiki That Edited Me. 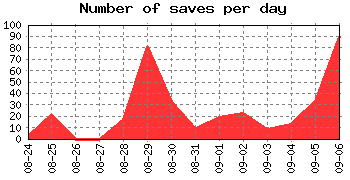 Charts of editors and saves by Peter T.
I believe the Wired Wiki experiment can be called a success, and yesterday I would have said it was doomed. Just came back from Wiki Wednesday, where Wired reporter Ryan Singel held a conversation about it. How we conducted the experiment, what part of the editorial process it was directed at it and the participation of the community gives us a lot to learn from. Do recall that the use of wikis in journalism has been significantly tainted by the LA Times Wikitorial debacle. It was a failure in wiki implementation, goal setting, content structure and moderation. While the media has embraced public blogs, they still have a while to go before public wikis are accepted. When I was an intern I got into an argument with the editor of the Washington Post that ended with him telling me I have a perception problem. Since then I have been trying to prove him wrong, but that's a larger story, right now I might tell him the same thing. It could be argued that a WYSIWYG editor enabled domain experts to contribute, but in this case the domain was wikis, so it probably wasn't a factor. Nevertheless usability always matters. Choosing an article, instead of an editorial, provided an implicit guideline for what was acceptable. There was one lesson from the Wikitorial, something I saw coming back then, that we had to employ in the middle of the project. With the Wikitorial, an edit war ensued with differing viewpoints. Jimmy Wales stepped in and forked the page, creating pro and con editorials. With a wiki, there is space for everyone, even when the topic is war. In this, the topic was wikis where lots of people have a stake. Wired endorsed an Enumeration to also be published, for remaindered links and references. This served as a pressure release valve, to let the quality of the main article improve. The collaboration was for an open group of participants to play the role of editor to Ryan's original submission. This is a very unusual role for most participants, and most chose to edit directly in ways that an editor accountable to both the institution and journalist would not. While there was a goal, there were no guidelines. Closest thing was pointing to the Wired Style Guide. There were no rules, norms or conventions. Unlike the Esquire experiment, there was no benefit from Wikipedia's established guidelines. Leadership was passive. Wired explictly did not edit the article and did not pass judgement. The article initially evolved reasonably. A pattern I have seen before, say with sharing Wikified Books, where most of the contributions were lightweight and adding in references and associations that came to the minds of readers. Personally, I stayed out of the initial editing fray (Wired did too, more on that later) to leave room for others. But a wave of edits came in. Angela called it "here's my favorite wiki" links. This did reflect the topic of the article, a domain of vendors, open source and public wiki project managers. Almost every wiki vendor added a link to themselves and editing in their positioning. Part of this is a sad commentary about the space, I can tell you that if this experiment was done 2 years ago, the contributions would be more, uh, wiki-like. There were some real gems, particularly in the education section. One person took it upon themselves to interview an expert at Harvard after coordinating with Ryan and contributed a quote that persisted. Someone suggested an expert to Ryan on the Comments page, but he didn't have time to interview her. She got word of the experiment and contributed persistent edits herself. There was a minor dispute within the section, and some backchanneling between the parties, but the result stands. Whereas the Wired Wiki story became too long, and became a soapbox for too many wiki, editors moved some of it to this page. Hark, and know that you are upon an epic enumeration of wiki. 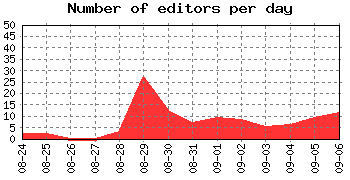 Here, mentions of many wiki sites shall you find, and links shall you encounter. At first I thought it was crazy, but then saw the wisdom. Unfortunately, this created a vacuum that was quickly filled with the same. Yesterday, with the deadline approaching, I thought the experiment would be a failure. This morning there was a significant amount of edits, including some multiple detailed edits by one editor. Suddenly, the article was a story again. And the edits persisted. At present, there is no plans for a community and I wouldn't say that one took root. But some common understanding was reached in a short period of time. I gained greater confirmation about some mediative techniques and moderation practices. There are better parts of the editorial process to apply this too, some proven already, and many happening behind the firewall, but much work to be done. The result is a good story, dear reader (at the moment), I leave to you to judge. Tomorrow night's Wiki Wednesday Palo Alto will feature an open conversation with Wired News reporter Ryan Singel about lessons learned from the Wired Wiki experiment. I expect we will cover the broader topic of participatory media. We'll have a parallel conversation for developers about the REST API and STRUT (a conversion toolbox. See you Wednesday night, 6-8pm, at Socialtext. Great to be in Boston at the second Wikimania, the Wikipedia community conference. Keynoting at the first one in Frankfurt was an honor and joy. This time, I get to sit back and enjoy one of the most diverse hallways you will find. Wiki Wednesday in Palo Alto was a real hit. Jeremy Ruston provided a demo of TiddlyWiki and talked through the unexpected use cases, from GTD and beyond. Jeremy has something appealingly useful that is being extended through plugins by a burgeoning community. Some of his core insights were about how real people don't use the web. The AJAX-enabled accordion-style presentation-in-page UI is akin to tabbed browsing (which regular people don't do). TiddyWiki is an app as an HTML file, which means he gets to joke with people that by visiting the site they have already downloaded it. But by containing the app as just a file in a folder, installation is accessible. Pete, Adina, Jonas and I also talked about Socialtext Open and how improving the installer is our top priority. A funny conversation ensued about if making install too easy meant you wouldn't value the outcome as much. But it was great to meet some folks who did install and get their feedback.